విదేశాల్లో ఉన్నత చదువులకు రూ. 15లక్షల సాయం - విద్యార్థులకు వరం: గతంలో విదేశాల్లో ఉన్నత విద్యను అభ్యసించడం పేద, మధ్యతరగతి విద్యార్థులకు తీరని కలగా ఉండేది. రూ. లక్షలు ఖర్చు పెట్టాల్సి రావడంతో వెనకడుగు వేసేవారు. ప్రస్తుతం రాష్ట్ర ప్రభుత్వం ఎన్టీఆర్‌ విదేశీ విద్యాదరణ పథకాన్ని ప్రవేశపెట్టి అలాంటి విద్యార్థుల కలలను తీరుస్తోంది. ఈ పథకం కింద రూ.15 లక్షలు ఇస్తారు. గతంలో రూ.10 లక్షలు మాత్రమే ఇచ్చేవారు. మీసేవ ద్వారా మంజూరైన కుల ధ్రువీకరణ పత్రం, ఆదాయ, జనన , ఆధార్‌ కార్డు, ఈ-పాస్‌ ఐడీకార్డు, నివాస ధ్రువీకరణ పత్రం, పాస్‌పోర్టు కాపీ,పదో తరగతి మార్కుల జాబితా లేదా ఇంటర్‌ లేదా డిగ్రీ, లేదా పీజీ మార్కుల జాబితాలు, విద్యా సంస్థ జారీ చేసిన ప్రవేశ పత్రంతోపాటు ప్రభుత్వం అడిగిన ఇతర ధ్రువీకరణ పత్రాలు జత చేయాల్సి ఉంటుంది. అర్హులు: విదేశాల్లో చదువుకోవాలనుకునే విద్యార్థుల తల్లిదండ్రుల ఆదాయం ఏడాదికి రూ. 6 లక్షలు మించకూడదు. ఏ సామాజిక వర్గానికి చెందిన విద్యార్థులైనా దరఖాస్తు చేసుకోవచ్చు. మీసేవా కేంద్రాల ద్వారా ఆన్‌లైన్‌లో దరఖాస్తు చేసుకోవలసి ఉంటుంది. విదేశాల్లో అవకాశం: యూఎస్‌ఏ, కెనడా, యూకే, సింగపూర్‌, ఆస్ట్రేలియా, జర్మనీ, న్యూజిలాండ్‌, స్వీడన్‌, నెదర్లాండ్‌, ఫ్రాన్స్‌, డెన్‌మార్క్‌, రష్యా, ఫిలిప్పీన్స్‌, కజికిస్తాన్‌, చైనా దేశాల్లో చదువుకునేందుకు అవకాశం కల్పించారు. ఆన్‌లైన్‌లో వచ్చిన దరఖాస్తులను రాష్ట్ర స్క్రీనింగ్‌ కమిటీ పరిశీలిస్తుంది. ఈ కమిటీలో ఛైర్మన్‌గా బీసీ వెల్‌ఫేర్‌ ఫెడరేషన్‌ కార్యదర్శి, సభ్యులుగా రాష్ట్ర ఉన్నత విద్య కార్యదర్శి, జేఎన్‌టీయూ వీసీ, సాంకేతిక విద్య కమిషనరు, కన్వీనరుగా బీసీ సంక్షేమ శాఖ డైరెక్టరు ఉంటారు. వీరి పరిశీలనలో అన్నీ సవ్యంగా ఉంటే ఆయా జిల్లాల్లోని సామాజిక వర్గాల కార్పొరేషన్‌ కార్యాలయాలకు దరఖాస్తులు వస్తాయి. తరువాత కలెక్టరు కార్యాలయానికి పరిశీలనకు వెళ్లి ట్రెజరీ ద్వారా రెండు విడతల్లో గరిష్ఠంగా రూ. 15 లక్షలు మంజూరు చేస్తారు. "AP BC Overseas Scholarships: NTR Videshi Vidyadharana(Mahatma Jyothiba Phule B.C Vidya Nidhi)" for Higher Studies in Overseas Universities: B.C Welfare Department has requested to rename the Scheme as "NTR Videshi Vidyadharana" instead of "Mahatma Jyotiba Phule BC Vidya Nidhi" for providing Financial Assistance to eligible BC Graduate Students to pursue Post Graduate studies in Abroad. BCWD - NTR Videshi Vidyadarana Scheme - Financial Assistance to Backward Classes and Economically Backward Classes students for pursuing Higher Studies in Abroad - Orders - Issued - Amendment - Orders - Issued. 1. G.O.Ms.No.29, BC Welfare (B) Department, Dated: 27.8.2016. 2. G.O.Rt.No.174, BC Welfare (B) Department, Dated: 7.12.2017. 3. From the Director, Backward Classes Welfare, A.P., Vijayawada Lr. No.B1/1840/2018, Dated: 11.10.2018. In the G.O.1st read above, Government have issued orders introducing the Scheme “NTR VIDESHI VIDYADARANA" for Financial Assistance to B.C. Students to pursue Post Graduation studies in abroad. In which certain guidelines were also issued. As per said G.O. there is no provision for MBBS course in abroad and also no provision to sanction of Travelling and Visa charges to the B.C./EBC students. 2. In the reference 2nd read above, Government have accorded permission to the Director, Backward Classes Welfare, A.P., Vijayawada to utilize the budget allocated for the Scheme of providing financial assistance to Meritorious Economically Backward Class Students for Overseas studies duly following the guidelines issued in the reference 1st read above. i. Sanctioned Travelling and Visa Charges to some of the students. ii. selected some candidates for financial assistance who are pursuing MBBS course . And requested the Government to ratify his action mentioned above. 4. In addition to above, the Director, BC Welfare has also requested to issue amendment orders and include the “ Travel Grant & Visa Fees and also the Scheme study of MBBS course abroad” to the BC and EBC pursuing students under NTR Videshi Vidyadharana Scheme. 5. Government after careful examination of the entire matter hereby ratify the action of the Director, BC Welfare, A.P., in having issued orders mentioned at para (3) above. i. Travel Grant : One way ticket (lower fare) by economy class for the shortest route shall be payable upon production of a valid visa and admission particulars. ii. Visa Fees : The total visa fees shall be reimbursed to the student upon production of valid visa and production of fee receipts . iii. MBBS course: The scheme includes the study of MBBS course abroad. 7. The Director, B.C. Welfare, A.P., Vijayawada shall take further action accordingly. AP BC Overseas Scholarships: Government of AP have made substantial investments through providing Post-Matric Scholarships to BC students on a Saturation basis. This laudable initiative over the years has encouraged a large number of BC students to complete professional Courses and other Graduate Courses. Government in Social Welfare Department have issued orders introducing a New Scheme “Ambedkar Overseas Vidya Nidhi” to SC students to enable the benefit of Higher Education in Foreign Universalities to meritorious SC students there by providing them an opportunity for better career prospects within the Country and abroad. 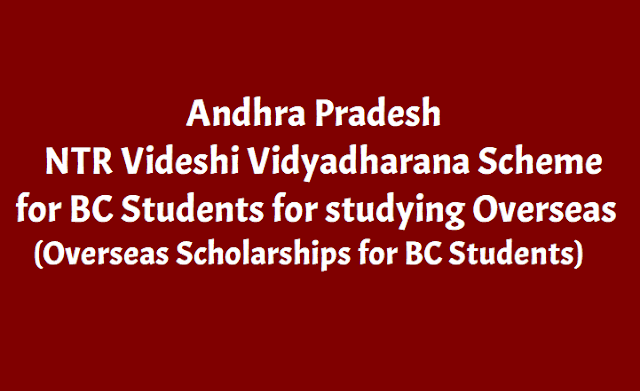 AP BC Welfare has sanctioned of the scheme ” NTR Videshi Vidyadharana ” Financial Assistance for BC students from the year 2018-19 on the same lines of “ Ambedkar Overseas Vidya Nidhi” being implemented for SC students. “NTR Videshi Vidyadharana” will be sanctioned to 1000 BC students every year and is open to all eligible BC student graduates to pursue Post Graduate studies abroad. Income: BC Students whose family income is less than Rs.6.00 lakh per annum from all sources are eligible. In Social Welfare scheme, the income limit is Rs.6.00 lakh. Total income from all sources of the employed candidates or his/her parents/guardians, shall not exceed Rs.6.00 lakhs per annum. In all cases the income certificate must be obtained through MEE SEVA. A copy of the latest Tax Assessment as well as the latest they salary slip from the employer is also required to be enclosed with the application. 1) For Post Graduate Course: Degree in Engineering / Management / Pure Sciences /Agriculture Sciences / Medicine & Nursing /Social Sciences/Humanities. 2) For PhD Course: P.G course in Engineering / Management / Pure Sciences / Agriculture Sciences / Medicine / Social Sciences/ Humanities. One Child in a family one time Award: Not more than one child of the same parents / guardian’s will be eligible and to this effect a self certification will be required from the candidate. The awardee cannot be considered for the second or subsequent times as the individual can be awarded only once in a life time. Countries eligible under the Scheme: USA, UK, Australia, Canada, Singapore, Germany, New Zealand, Sweden, Netherlands, France, Denmark, Russia, Philippines, Kazakhstan and China (Philippines, Kazakhstan and China only for medicine). vi) The candidate can change the course of study or research. Permission will be accorded on a case by case basis, subject to the approval by the State Level Selection Committee constituted under the Scheme. vii) It will be the responsibility of the candidate to obtain the appropriate visa or a country wherein one intends to study further under award from the Scheme and the Visa issuing authorities may kindly see that only such type of visa be issued which only permits the candidate to pursue specified course abroad and thereafter the candidate returns to India. viii) The applications should be complete in all respects and should be accompanied by all relevant documents. The applications, incomplete in any respect, are liable to be rejected. i) Notification shall be issued in leading dailies calling for applications and wide publicity will be given in University Campuses and in e-PASS portal in August/September. ii) All such students desirous of applying for financial assistance for studies abroad shall apply online from 1st August to 30th September. iii) 33% of the awards shall be earmarked for Women Candidates (if adequate number of eligible women candidates are not available then Male candidates may be selected against this 33%). Bifurcation of BC quota as 7 : 10 : 7 will be done between BC-A,B, D groups. The awards shall be proportionately allocated to the 13 districts based on number of eligible applications from each district. iv) The registration shall be made under the scheme online at http://www.epass.cgg.gov.in. ii) Sanction proceedings mentioning that Rs.10.00 lakhs (గతంలో రూ.10లక్షలు ఉండేది) is sanctioned to the individual towards fees and living expenses by way of a grant subject to his/her joining the Course, shall be issued to the Candidates selected by the Selection Committee. The sanction proceedings can be made use of by the Candidates for obtaining a Visa from the respective Embassy. iii) Earnings from Research/Teaching Assistance-ship: The awardees are permitted to supplement their prescribed allowances by undertaking Research/Teaching Assistantship.